For the last few months, I've been running a little experiment. 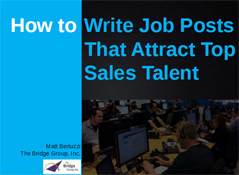 A pool of Inside Sales Rep volunteers & I have been sending sales job posts to one another. Each person would rate the posts with a simple thumbs up or thumbs down against this question, "Do you find this position and company interesting?" The team reviewed posts for sales positions at 97 different companies. And the results weren't pretty. Less than 22% were deemed 'interesting' by at least one rep. Only 9% received two or more thumbs up. Got an interesting job post? Please share it in the comments. We'd all love to learn what is working for you.